Did you know that 7 out of 10 deaths in the U.S. are due to chronic diseases? A chronic disease is one that lasts three months or longer, such as diabetes, arthritis, and dementia. Not only are chronic conditions killing us faster, they’re emptying our pockets in the process too. According to the National Health Council, more than 75% of all health care costs are due to chronic conditions. Four of the five most expensive conditions are chronic: heart disease, cancer, mental disorders, and pulmonary conditions. However, there is good news: Most chronic diseases are preventable and even reversible through lifestyle changes. That’s right. Adopting a healthier diet and an exercise regime can be more effective at treating disease than popping pills. This makes perfect sense when you consider why chronic conditions happen. Most of our modern ailments — obesity, diabetes, heart disease — are triggered by lifestyle factors, such as eating junk food, not exercising, overworking, and sleeping poorly. If traditional health providers focused on improving these factors in people’s lives instead of relying on prescriptions drugs, chronic disease rates would drop dramatically. The problem is our modern healthcare system is not designed to treat the lifestyle causes of diseases, only the visible symptoms. 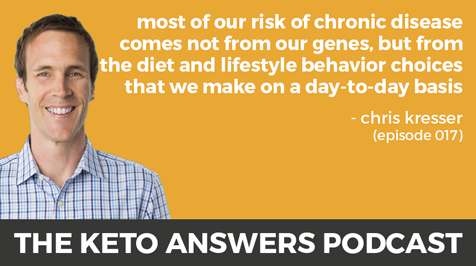 That’s why today’s guest, Chris Kresser, believes the key to healing chronic disease is functional medicine. Functional medicine is focused on finding the root causes of disease and addressing them directly to completely prevent and eradicate symptoms. Chris Kresser is a leader in functional and integrative medicine, one of the most influential people in the health space, author of the book Unconventional Medicine, and wildly successful entrepreneur. Today we delve deep into what functional medicine is, why it’s vital for treating chronic disease, the role that genes and lifestyle play on diseases, and the powerful habits you can adopt to prevent chronic conditions.